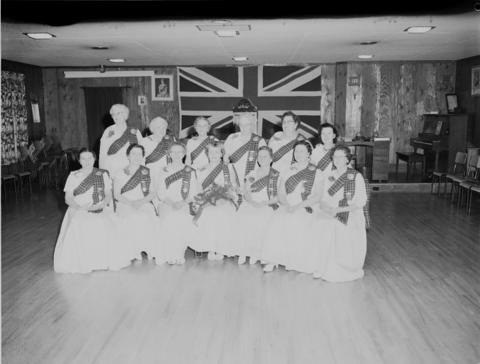 This picture shows the installation of officers for the Queen Mary Camp, Number Four, Daughters of Scotland at Orange Hall. Front: E. Benallick, L. Milton, J. Graham, M. Brown, E. Bould, M. Howitt, I. Fleming. Back: R.R. Graham, M. Murray, J. McDermid, J. Brydson, M. McGladrey, and A. Finlay.